Kristie Faufaw, who owns Ryan & Casey Liquors in Greenfield, made a point during a meeting small business owners held with Governor Charlie Baker on Tuesday. Small business owners grappling with proposals to raise the minimum wage and mandate paid leave expressed their frustrations to business leaders and state lawmakers Tuesday morning — in loud and often heated terms — repeatedly stressing how the increased costs could force them to cut workers, raise prices, or close their doors for good. “Am I the only one who finds this whole thing insane?” someone asked. 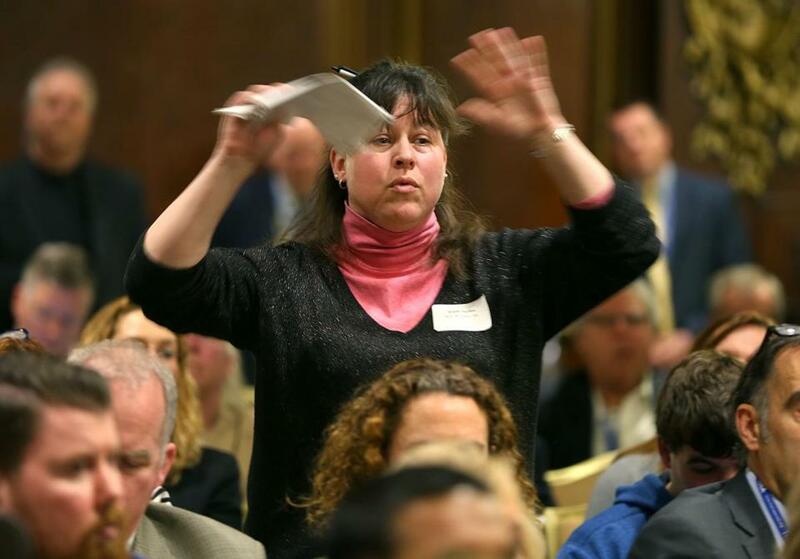 Restaurateurs, shop owners, a zoo executive, and a day-care provider were among several hundred people who packed a meeting room at the Omni Parker House to voice their concerns to business leaders, legislators, and Governor Charlie Baker. Christopher Carlozzi, event moderator and head of the National Federation of Independent Business Massachusetts, repeatedly urged business owners to head to Beacon Hill after the forum ended to meet with their state legislators. At issue are bills to raise the state minimum wage from $11 to $15 an hour, and the tipped minimum wage from $3.75 to $9, by 2022, and require businesses to give employees up to 16 weeks of paid family leave for the birth or adoption of a child and up to 26 weeks of paid medical leave for serious injuries or illnesses. If lawmakers fail to act, the measures will go before voters in the fall. Ballot questions to increase tax on income over $1 million and reduce sales tax were also briefly discussed. These are far from the only financial pressure facing the state’s small business owners, said Bob Luz, president of the Massachusetts Restaurant Association. Within the last few years they have had to deal with the minimum wage rising from $8 to $11 and paid sick time becoming state law. Unlike 39 other states, Massachusetts doesn’t have a lower teen or training wage, and the state is one of only two that require retailers to pay time and a half on Sundays and holidays. In addition, health care costs are soaring and online retailers are leeching sales from local stores. Jon Hurst, president of the Retailers Association of Massachusetts, said he has never heard so much anger and concern over the future of small business. And he holds unions responsible for pushing these pro-worker measures. Tony Tierno, owner of Spin Cycle Laundromats in Wakefield and Methuen, estimates he would have to cut back on his employees’ hours and raise prices by about 10 percent if minimum wage and family leave mandates are enacted. “We’re catering to low-income people that are coming in to use our machines, and we have to go up on the prices on these people,” he said. The state lawmakers at the forum, members of the Joint Committee on Labor & Workforce Development, tried to assure the testy crowd that they were trying to work out a compromise to keep the issues from going to the ballot, an effort Baker said he supported. Raise Up Massachusetts, the coalition of labor, religious, and community organizations behind the previous wage hike and paid sick leave law, is leading the charge on a $15 minimum and paid family leave, and has collected enough signatures to put the issue to voters. “At the end of the day, we don’t hold the cards. They do,” said Senator Jason Lewis, a Democrat and chair of the Labor and Workforce Development Committee. A number of business owners are in favor of a $15 minimum wage, including more than 250 around the state who have signed a Massachusetts Business for a Fair Minimum Wage statement. Higher wages lead to more consumer buying power, which leads to job creation, the statement notes; higher wages also mean lower turnover, reduced training costs, and increased productivity. Representative Joseph McKenna, Republican of the 18th Worcester District, noted that business owners are at a disadvantage in the court of public opinion because low-wage workers’ stories are so powerful. “The challenge is that the testimony in favor of these things is very emotional,” he said, urging those in the crowd to talk less about the bottom line and more about the personal hardships they are facing. Erin Calvo-Bacci, owner of a chocolate manufacturing business in Swampscott, obliged, standing to say she had already sold her house and moved her family into a two-bedroom apartment to keep her business afloat. But speaking out against higher wages is not a popular position, she said. “A lot of people are too afraid to speak because of the bullies,” she said. Mary Grimmer, owner of three Little Treasures Schoolhouse child-care centers north of Boston, said that if these measures are approved, raising rates might not be enough. She could be forced to let her music and science teachers go, or possibly replace college-educated teachers with less-experienced assistants. Southwick’s Zoo in Mendon employs 200 people in the summer, many of them students, but if some sort of training wage isn’t enacted to offset a $15 minimum, the zoo would have to stop hiring young people, said vice president Cindy Lavoie. The zoo is even looking into a ticket-selling machine to cut down on labor costs, but that could hurt customer service. “We’d rather have people,” she said.